Leeds United's Jack Clarke and Reading's Leandro Bacuna battle for the ball. Our fans’ panel have their say on Leeds United’s Championship derby at Sheffield United tomorrow. Tomorrow will be a big test of character for Marcelo Biesla’s men against a consistently strong Sheffield United. After two games against teams in the Championship’s bottom half Leeds will come face-to-face with one of the division’s strongest. 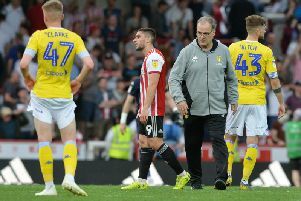 The Blades have developed a reputation for aggressive attacking football under Chris Wilder and through their evergreen strike duo of Billy Sharp and David McGoldrick they have two players who know where the back of the net is. It will be a test, then, for Leeds who have kept two clean sheets in their two previous games. Bielsa will be hoping that his side will be more clinical in front of goal with many predicting a high-scoring encounter. Only Middlesbrough have shut the Whites out this season. Last season Leeds put in two spirited performances against their rivals from the Steel City but ultimately came away with nothing. This will be a big opportunity for Leeds to show how far they’ve come since then. Prediction: Sheffield United 2 Leeds United 2. Leeds United have steadily climbed the form table and only Norwich City have accrued more points from the latest six games. In that time though, our four wins have all come against sides in the bottom seven of that table, sides out of form. Going to Bramall Lane feels a bit like our trip to the Hawthorns; we know that at our best we can beat anyone but we haven’t seen our best, not for a full 90 minutes, for weeks. Against poor sides we have managed to edge some close games despite always dominating the possession. Getting anything out of the Blades will be tough; they have a fine home record of five wins, three draws and only one defeat (Swansea in August), the fourth best record in the Championship; only Leeds and West Brom have earned more points at home. Leeds should be reinforced with the return of Pontus Jansson and I’d be amazed if Samuel Saiz is not in the starting XI and, on that basis, I’ve got everything crossed for a point. Leeds United have won two games in four days and sit in second place in the Championship. Both the 2-0 win over Bristol City and Tuesday’s win over Reading weren’t pretty but what matters is another six points added to Leeds’ total. Despite a lengthy list of players out injured the squad has surprisingly coped well and the youngsters who have been given an opportunity haven’t been overawed by the step up from the under-23s. Marcelo Bielsa has stated that the changes he made for the visit of Reading were tactical and nothing to do with how Will Huffer and Aapo Halme performed against Bristol City. Sheffield United are playing well and have only lost one game in the last six they have played. Whilst Leeds were beating Reading they beat Brentford 3-2 at Griffin Park. Chris Wilder has gone about his business quietly and has a very good squad to pick from including a man that was once at Elland Road, Billy Sharp. He didn’t have the happiest of times at Leeds but has shown in games against his old club that he still knows where the net is! The popular striker scored in both games against Leeds last season. Most of the conjecture after the Reading game was whether Gjanni Alioski should continue in the starting XI, his performances in the last two games have been unspectacular to say the least and he was substituted at half-time on Tuesday. His replacement Jack Clarke did more in 40 minutes than Alioski had in previous games, the youngster has obvious pace and many want him to get a run in the starting XI. Marcelo Bielsa though has stood by Alioski and may see this game as one where experience outweighs youth. Sheffield United did the ‘double’ over Leeds last season so it is hoped that a little revenge will be handed out by Leeds. I’d love a win over them, but think a draw is the likeliest result. United’s last two games were won in an unspectacular but efficient style. Bailey Peacock-Farrell’s penalty save secured the points against Reading but any result other than a win for the Whites would have been a travesty of justice. A sterner test awaits at Bramall Lane tomorrow, with the Blades also buoyed by their late win at Brentford. With both sides bursting with confidence this is a fixture to look forward to. Having previously dropped points in their local derbies against Sheffield Wednesday and Rotherham United, the Blades needed that victory to restore some much-needed momentum. In the corresponding fixture last February, nemesis Billy Sharp scored two goals to give Chris Wilder’s men a 2-1 win. The Blades will meet a stronger and more motivated team this time and predicting this result is not an easy task. The head says it should be a draw but I am going to follow my heart as this is a fans’ forum not a tipster service. Prediction: Sheffield United 1 Leeds United 2. A good win on Tuesday against Reading and a finale that was a good as a last-minute winner will be followed by an intriguing Yorkshire derby at lunchtime tomorrow. I can’t possibly predict a Leeds win in this game. Ever since my first couple of trips to Bramall Lane, in our double cup exit of 2002/03, we’ve had little more than misery on our visits to that particular part of Sheffield. There are few teams that up their game as much for a fixture against Leeds than Sheffield United do. Whatever our respective league positions, it pretty much goes out of the window for 90 minutes of attrition. This season we are closer than has been the case for a number of seasons and we have a stronger, more resilient team than usual so you never know but it’s got to be safest to bet against an away win on this occasion. Prediction: Sheffield United 2 Leeds United 1. When it’s seconds out, round one at Bramall Lane tomorrow, the Blades will come out with all fists flying. Leeds will box clever and hope to withstand the onslaught and squeeze in a few cultured jabs of their own. The Whites hit the canvas last time out on the road; seeking to get back level on points they opened up to the sucker punch. Several times. Bielsa tries to win games. If Leeds concede first and chase the game they face another drubbing but remember a win is equal to three draws and going for a knockout reaps its rewards. However, if ever there were a game to be satisfied with one point, this is perhaps it. It’s easier to predict the team than the result. Gjanni Alioski and not the callow Jack Clarke, will start the derby. The Macedonian will support Barry Douglas for much of the game rather than vice versa. Stuart Dallas will add a bit of savvy, Adam Forshaw will play ahead of Samuel Saiz. It is the game that Pontus Jansson has been kept in ice for. The visitors will require steel, and rapier sharp too – a clicking Klich and a ruthless Roofe. It is a stern test for Peacock-Farrell who said this week that corners were nearly as bad as penalties. It is a weakness in a side that prefers boxers in defence rather than sluggers. The home side will pummel away. Perhaps they themselves will be left open to a telling punch.